Interpreter of Maladies NPR coverage of Interpreter of Maladies by Jhumpa Lahiri. News, author interviews, critics' picks and more. shoulders, and left it in the hallway as she walked into the kitchen. claimed she would never resemble. other hand. "But they should do this sort of thing during the day." India. "When do the repairs start?" red with blue lettering. It was cavernous compared to their own car. way it was possible to smile at people known only professionally. indicate that she would not be able to have children in the future. would not have to choose from to teach his classes that semester. bedroom house, spending as much time on separate floors as possible. still reached for each other's bodies before sleeping. Shoba would get through it all somehow. She was only thirty-three. garlic smell, a trick he'd learned from Shoba. It was seven-thirty. and water drained steadily into grates in the pavement. lights go," she said, heading for the staircase. "I'll be down." decided, at the last minute, to spend the night. Shoba was different. It astonished him, her capacity to think ahead. by one. She didn't mind being jostled, even when she was pregnant. she cooked on Sundays, stirring boiling pots of tomatoes and prunes. arsenal of colored pencils at hand. hers as they walked among the guests at the party. and said, "But you weren't even there." It struck him as odd that there were no real candles in the house. digital clock radio and tuned it to a jazz station. at the bright paprika stew. bone. "It's ready," he announced. the rest of the candles and a book of matches by his plate. ankles crossed against the lowest rung, left elbow on the table. candles and drove them into the soil of the pot. candelabra. "Sometimes the current disappears for hours at a stretch. just cried and cried. It must have been so hot." if it was a boy, seven if it was a girl. He refilled the wine in her glass. She thanked him. trying to amuse her. He learned not to mind the silences. focus on a distant object. It was a habit of hers. parents, who settled in New Hampshire, used to go back without him. "Let's do that," she said suddenly. "Say something to each other in the dark." "Like what? I don't know any jokes." other something we've never told before." in. I think we'd known each other two weeks." you'd promoted me from the margins of your newspaper." "No. But I didn't give up on you. Now it's your turn." audience as they sighed and nodded solemnly after certain phrases. back of a folder, and was startled to find that she was beautiful. next morning, found out his name, left money with the manager." "You went all the way back to Somerville just to tip a waiter?" "Why did you forget to tip the waiter?" first time. "It must have distracted me." room, behind her barricade of files. "Don't worry about the dishes," he said, taking them from her hands. onto a sponge. "It's nearly eight o'clock." shy, the way he felt the first time they stood together in a mirror. "Let's sit outside," Shoba said. "I think it's warm still." of neighbors passed by with flashlights. September. "I hear they've got their power." "They'd better," Shukumar said. "Or you'll be browsing in the dark." husband's elbow. "Want to join us?" Shukumar that his words matched hers. needed her to talk first, in order to reciprocate. went out with Gillian and had a martini." in-laws. It was Gillian who had driven Shoba to the hospital. "Your turn," she said, stopping his thoughts. the houses lining the street. Candles glowed in the windows of one. In spite of the warmth, smoke rose from the chimney. or not. I looked at his answer and copied it down." why you did it," she said, moving closer to him. back. Then they stood up, his hand still in hers, and went inside. minute or two. It was the closest he'd come to infidelity. bought them, along with a beeswax candle and two bottles of wine. game," he said when he saw her reading the notice. hadn't been to the gym tonight. She wore a suit beneath the raincoat. Her makeup had been retouched recently. and put on a record, a Thelonius Monk album he knew she liked. up, turned on the light switch, and sat down again. when I tell you this," she said gently. hadn't been prepared then. Now he was. to pretend to be happy. narrowing her eyes on something, it seemed, behind his left shoulder. deposit. The apartment was on Beacon Hill, so she could walk to work. She had signed the lease that night before coming home. baby might help him with the process of grieving. Shoba was asleep. fingers were curled shut, just like yours in the night." wept together, for the things they now knew. 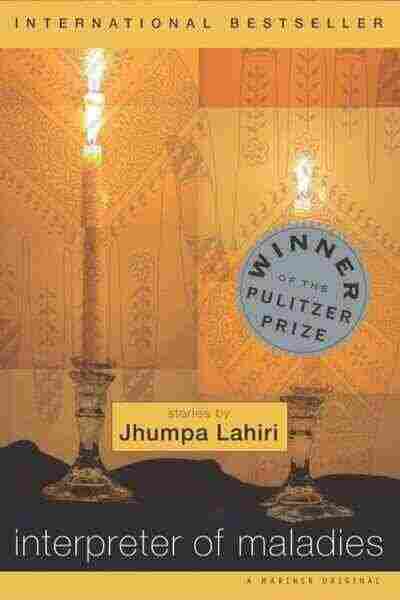 1999 , Jhumpa Lahiri used by permission by Houghton Mifflin Company.